January 14, 2016 update: At Salesforce, we are committed to being a sustainable company and harnessing our culture of innovation to foster a better world. A few weeks ago, we announced our first major renewable energy agreement. Today, we are announcing that Salesforce is doubling down on our commitment to renewables by signing a second wind agreement. These two agreements are our biggest step yet toward powering 100% of our global operations with renewable energy. Together, they expected to generate more electricity than all of our global electricity use in fiscal year 2015. In December 2015, we signed a 12-year wind energy agreement for 40 megawatts (MW) of a new West Virginia wind farm through a virtual power purchase agreement (VPPA). The electricity generated under the agreement is expected to be 125,000 megawatt hours annually, which is more than Salesforce’s data center electricity use in its full fiscal year 2015. In other words, enough energy to fully charge 30+ million iPhones daily for an entire year. That’s a lot of phones! In December 2016, the wind farm will be operational and start delivering clean, renewable energy to the same regional electricity grid that currently powers the majority of Salesforce’s data center load. This region also happens to be a particularly dirty part of the U.S. electricity grid, with much of its production coming from coal. On January 14th, we announced our second renewable energy agreement. 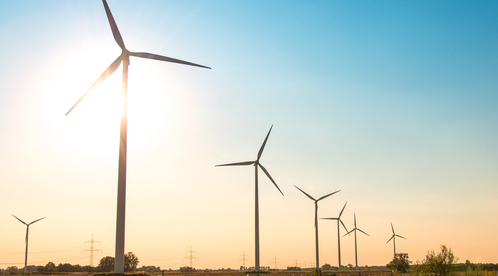 This new, 12-year agreement is for 24 MW of a Texas wind farm. The wind farm will be online and adding clean energy to the grid by the end of this year. 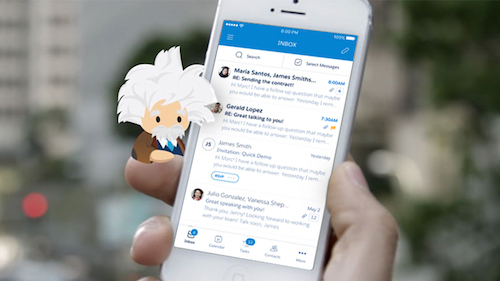 The electricity generated under the Texas and West Virginia agreements is expected to be 227,000 megawatt hours annually, which is more than Salesforce’s global electricity use in its full fiscal year 2015. Together, these agreements bring us closer than ever to our renewable energy goal. We’re proud that renewable energy projects like ours are helping to shift the global economy away from reliance on fossil fuels. We know companies have a key role to play in protecting our planet, improving society and enriching our communities. We believe the cloud should be powered by clean sources of energy. That’s why we joined RE100, committing to eventually power 100% of our global operations with renewable energy. RE100 is a group of influential businesses working to increase corporate demand for renewable energy. Currently, the private sector accounts for more than half of the world’s electricity consumption. 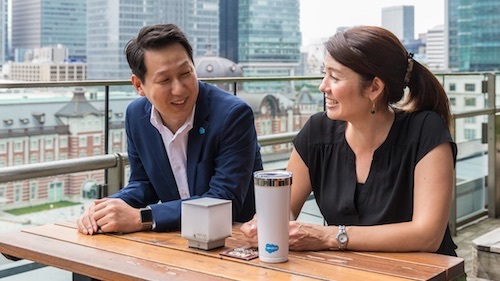 By switching to renewables, companies like Salesforce can help accelerate the transformation of the global energy market and aid the transition to a low carbon economy. We congratulate the companies who have made this pledge with us and encourage others to get involved. We see the development of renewables as an important part of our sustainability strategy. To address the challenges companies face when buying renewable energy, we became a founding member of the Business Renewables Center (BRC) and one of forty-three corporate signatories who developed the Corporate Renewable Energy Buyers’ Principles. The BRC and Buyers’ Principles work to streamline and accelerate the corporate procurement of wind and utility-scale solar energy. We’re thrilled to be participating in this work and contributing to a global shift toward clean energy. 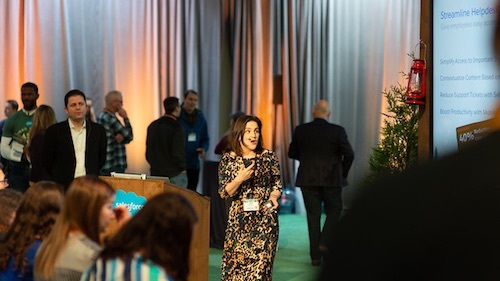 At Salesforce, we work every day to embed sustainability into all aspects of our business in order to achieve RE100 and net-zero greenhouse gas emissions by 2050. For example, Salesforce has long been committed to greening our global offices. We pursue LEED certification for our office spaces as well as other innovative green building initiatives. Once our spaces are built, passionate employees on our Earthforce green team help us operate more efficiently by conserving energy, saving water, and minimizing waste. Earthforce members also raise awareness within the company around key environmental issues from climate change to responsible purchasing, and everything in between. Every month of the year, especially during Earth Month, you can find our employees giving hundreds of hours of volunteer time to the sustainability causes they feel most passionate about. We also leverage our people, technology and resources to support environmental organizations around the world. We improve communities worldwide through our 1–1–1 integrated philanthropy model, which leverages the resources of Salesforce for public good: donating 1% of Salesforce’s product, 1% of Salesforce’s equity and 1% of employees’ time to help nonprofits achieve their missions. Read more about this work at Salesforce.org. With these renewable energy agreements, we’re excited to go further to demonstrate our commitment to protecting our planet for all to enjoy. But we can’t do it alone. We invite you join us and track our work at: Salesforce.com/sustainability.